SEE FLOOR PLANS AND A DRONE VIDEO OF THIS PROPERTY ON Cape Cod Five Star...Enjoy five-star luxury and stunning panoramic views from this shingle style designer home. Soak in the new large hot tub which looks over Snug Harbor. Harbor House boasts a private vista of one of Cape Cod's most spectacular sunsets. 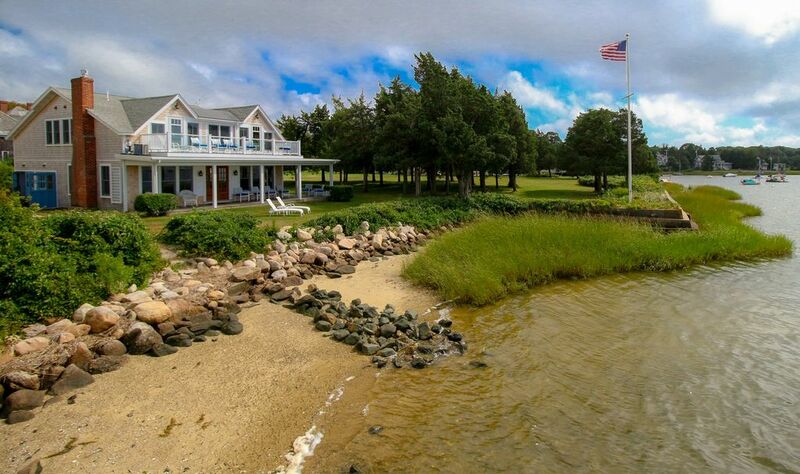 This home is just a step or two from the harbor's edge, you'll have your own private seaside get-a-way to enjoy. Harbor House, while in a private corner on Snug Harbor, is also conveniently located close to some of Cape Cod's most renowned beaches, bike paths, hiking trails, restaurants, golf courses, theaters, historic sites, natural areas, and so much more. Take a day trip to one of the Islands, Nantucket and Martha's Vineyard, or relax and enjoy the salty breeze from one of the home's many decks or hot tub. You will fall in love this award-winning home. While still in high school, I designed and built my first vacation home on Cape Cod. Later in University, I studied architectural preservation, with an emphasis on Cape Cod's famous Shingle Style home. In the early 90's, I began designing and building some of Cape Cod's most iconic homes in this style. Since, my travels around the world have inspired me to fuse the traditional Cape Cod style with subtle international influences and inspirations. My design personality takes advantage of this global perspective to include the finest comforts from all corners of the world. It has become my passion to find clever ways to subtly incorporate these finer influences into the warm and cozy style original to the Cape. Having rented my homes since 1992, I take very seriously my guests' experience. For example, Ocean House in Provincetown (HA 122422) is one of the most loved rental homes on the outer Cape. I am so excited to now open Harbor House, my newest home, for reservation. Don't wait, be one of the first to make your reservation and enjoy the art of living inside this wonderfully beautiful home. This property is perfect for those who want attached baths.There are three bed rooms with king beds and attached baths. All offer A.C. and room darkening shades for enjoyable sleep. One en suite is on the first floor making it perfect for guest who do not want to climb stairs. To access the first floor there is only 1 step. Currently there is a pull out couch in the living room which offers privacy. All bathrooms have large showers with custom natural stone floors and walls. Amazing outdoor shower on the south side of the house. one towel per person with 10 percent extra in home. Large living area with couch; can be made into a private downstairs bedroom by sliding door closed. Large, double-door refrigerator with ice maker. Additional two foot under counter beer and soda fridge. This is the third year in a row that my girlfriends and I have rented this house. It's the perfect place for our girls weekend - it's clean, well decorated, has plenty of space to sit and catch up, open gourmet kitchen to cook meals, big decks to relax on overlooking the water, comfy beds to sleep in and more. You won't want to leave! Great house. Has everything you can imagine and more! Beautiful house and location in west Falmouth. Great to walk around the area. And close to downtown if that’s your thing. Owner is also very easy to work with. Beautiful house with incredible views. Stocked with everything you could need. Hot tub was great and the sunsets spectacular. Couldn’t have been better. We had amazing stay at Harbor house! It is beautiful home with a great floor plan and perfect location. Highly recommend this amazing property! The Harbor House was gorgeous and in the perfect location on the Cape for enjoying nature or day time excursions. We will definitely go back! Craig the owner was very accommodating and made sure we were comfortable and gave us plenty of excellent restaurant recommendations. Falmouth's unique appeal blooms from its rich setting, important colonial heritage, and passionate protection of its abundant natural treasures. Paired with a refined taste for leisure, relaxation, and entertainment, and the natural beauty of world-famous islands, beaches, and waters, there is no better place to shed every care and become a Cape Cod beachbum.